A yell sounded from the cockpit that sounded like a cross between a battle charge and the yee-haw of a southwest cowboy 20 seconds into the ride of his life. Dean was at the helm as we rounded Admirality Inlet. Port Townsend was off the starboard bow, the weather was lovely, the evening air bright and snappy, and a nice 12-knot had pushed us rapidly across the straights from the San Juan Islands. Our day had started with otters playing on the transom, improved when we sailed quietly through a herd of sea lions, and absolutely shined as we crossed over waters well known for their cranky roughness and cantankerous weather-tide-wind combination. Now we were entering one of the nastiest tidal rips in the Pacific Northwest – a place renown for its tidal vagaries. We had timed our arrival very carefully. Anyone who spends any time whatsoever in PNW waters knows better than to ignore the tide and current tables. The horrible happens to all of us at least once. You’ll gauge the tidal swing wrong and ground the boat off Blake Island in the middle of the night. You’ll attempt to go through Deception Pass a half hour too late and then have to sit just east of the pass for five hours until the next slack. But you do it only once, and we had already benefited from just that sort of lesson. So here we were heading inbound on the flood and Dr C was whooping it up on the helm because he’d managed to steer us right into the current. We were like a raft running the rapids on a Force 4 river. The boat bucked and bounced and the chortle of the ripples all around us nearly drowned out my delighted husband who kept crowing at the GPS. Speed over ground had leapt from a dawdling five knots to thirteen. Dr C looked at me as if I had completely lost my mind. His point was well taken. With this much current, we could shoot down to Port Ludlow before night fall, making our last day to home slip that much easier and relaxing. There was also a good chance we’d have friends there. And frankly, at this point, there wasn’t much chance we could actually get to Port Townsend even if our very lives depended on it. Keep that in mind, fellow sailors. You cannot run against the tide around Marrowstone Point. Even if your motor is strong and your family is willing to buck the waves, the current will drive you backward and the rips will spin your boat around like a top. There are seasoned ferry captains who routinely delay ferry crossings to avoid this nasty current. Running with it, however, is another story and the ride of your life if you can just keep the boat pointed in the right direction. He looked so happy up there. I handed up a cup of soup and a handful of Trisquits and let him and the boat have their head. For twenty years we’ve ridden waves, currents, and tides. We haven’t always gone at the right time or in the right direction. Sometimes we’ve spun like a top until one or the other found a rudder, stuck it out, and brought us back to a stable course. It’s only in the last year that I can watch this drama play out so graphically on the water. We’ve swept along together for so many years, it is simply habit to put my trust in my man as the current drags us home. OK, OK, we can see him at the helm, in profile like Disko Troop with all his salt wetted and flag raised! But can he go to his left? 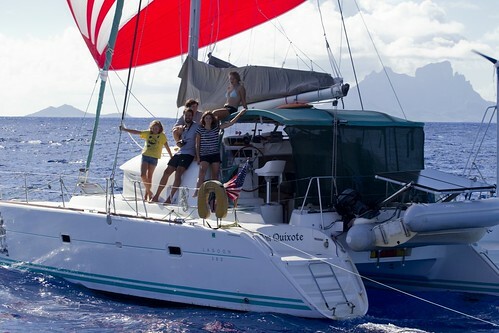 Concerning home schooling on a catamaran, can you affor about 10 more pounds? How about we make a six-pack of density samples in a little wooden carrier? I'm thinking lead, steel, aluminum, some plastic with an sg really close to 0.99, oak, and balsa or something similarly light in plastic. If they're all the size of a tomato paste can the steel sample weighs about 2.9 pounds, and there's a Golden lesson in there, too! In?